As a part of L'amour series Nokia 7370 is made of different materials: mat and gloss plastic, metal and leather all that with fabric label. The handsets are available in two color variants: gravel and dark brown. We dealt with the latter but both of them look gorgeously. Due to small dimensions and rounded shape the phone is very handy to hold. It opens easily with the help of one hand only and in whole while working with the handset you will rarely need the second hand. 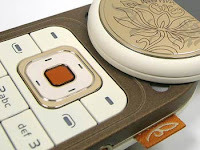 The phone opens semi-automatically that is you are to rotate the upper part slightly and the spring will do the rest. The same goes for the reverse process. It should be noted that you can close the phone only in the reverse to opening direction that is the angle of the upper part rotating is 180 and in the upper point there is a stop. What's special on Nokia 7370? The Ok key is also blue and the outer part of the rear cover is trimmed with leather. The case is quite resistant to scratches and it is not that easy to damage it. So the phone is quite beautiful and unusual and besides handy to use. The keypad is large scaled and pleasant to touch. It is made of glossy plastics and becomes available once the rotator is opened. The numbers and letters are seen clearly both in darkness and in the daylight as the backlight is bright enough. The navigation is done with the help of 4 positioned navigation key, OK key and programmable soft keys. As for the additional buttons there are three of them: volume control, power, camera key. The display is TFT with the resolution 240x320 pixels which is rarely high for Nokia. It supports 262K colors so the image is quite effective. Direct sunshine did not prevent us from reading even the smallest text on the screen. The camera is 1.3Mp with 8x digital zoom and video shooting possibility. Nokia 7370 has a new type battery BL-4B 700mAh. On intensive use the battery drains on the third day, provided you talk 15-20 minutes, listen 1hour to radio per day the battery will drain only on the fourth day. The phone is intended mainly for ladies but unlike some other models it does not have shimmering mirrors, pastes and glamour labels which is one of its merits for not all like pathos and shimmering. Besides Nokia 7370 has its special charm.